I may be overusing my arm, so need to stop cooking again for a couple of days, This is a dish I made Dave last Valentines Day and apparently never got around to posting. It's a good thing I jotted down some notes back then! The mango plays so nice with the green chilies, the bacon and the polenta; and if you read this blog often- you know what a fan of polenta I am!. Honestly- wrap anything in bacon and it's gonna be good! 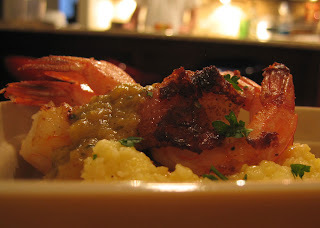 Bacon wrapped shrimp on polenta with mango-green chili sauce. 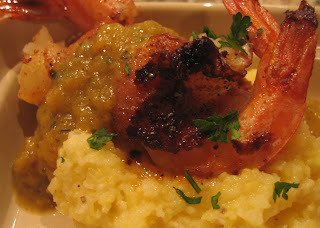 Start the polenta and the sauce first, then cook the shrimp. Creamy Polenta, as previously prepared. fry or bake until the bacon is crispy and the shrimp is pink. Add reserved green chili juice, 2 tablespoons of lime juice and ½ cup white wine. Simmer 5 minutes, blend with an immersion blender. Season with salt and pepper. To plate: place a spoonful of polenta in the middle of a plate or shallow bowl. Add 2 pieces of bacon wrapped shrimp and top with mango sauce and fresh parsley. Good heavens. Clicking on this blog was a mistake; now I'm drooling all over the keyboard. Your recipes look fabulous! Thanks Rachel! Try some recipes out and let me know how it works!